Before the outbreak of WW2 no country had a special combat uniform for its army. 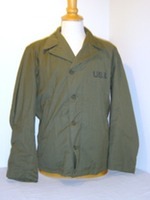 The uniform the soldiers wore during leave, was also their uniform for combat. Hence the British called their uniform “battle-dress”. In the late 1930’s the US Army tried several designs based on the idea that it should provide warmth, protection against wind, water repellent and room for free movement. Although the idea for a jacket that was reserved for field and combat duty is always considered to be from general Parsons. 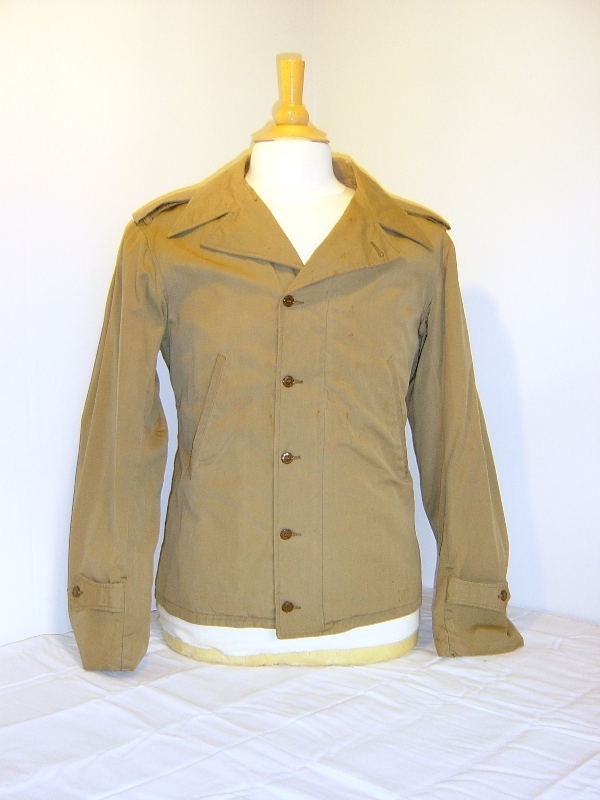 However, general Parsons was a Corps commander who supported the development of the jacket, but the real motor behind all this was a Sergeant Nicholson and in 1937 the army referred to the project as the "Nicholson Jacket". 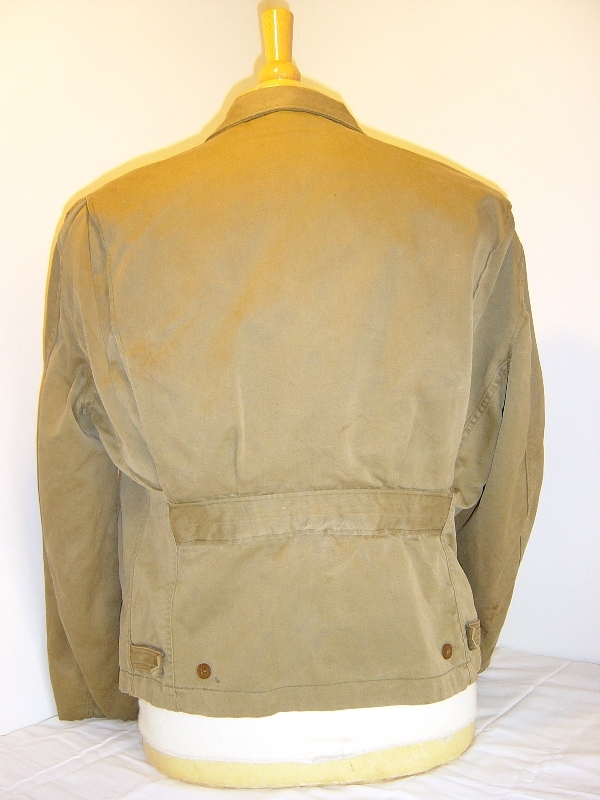 Later on it became known as the Parsons jacket. The design was based on an civilian style called wind cheater. Two fabrics for the outer shell were tested. 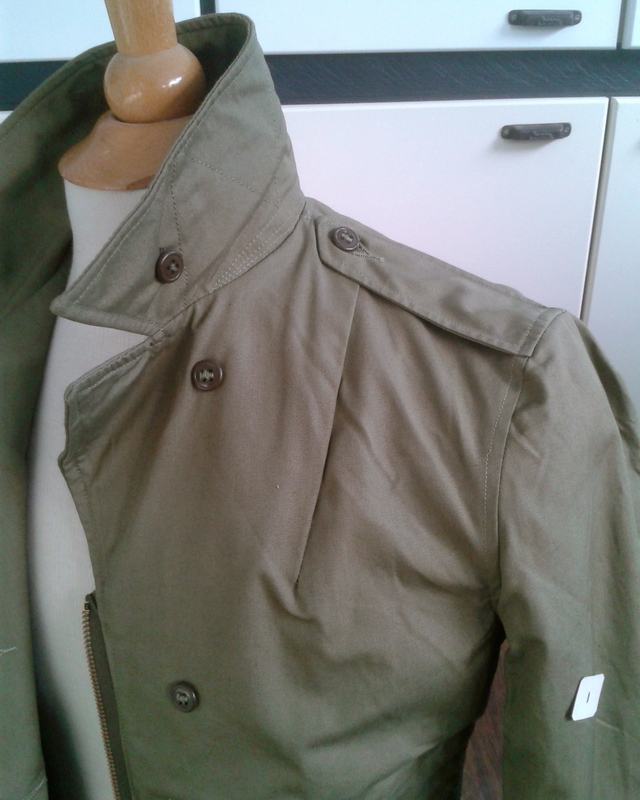 One fabric was the khaki twill, the same used for the tanker jacket, the other fabric was a poplin cloth. 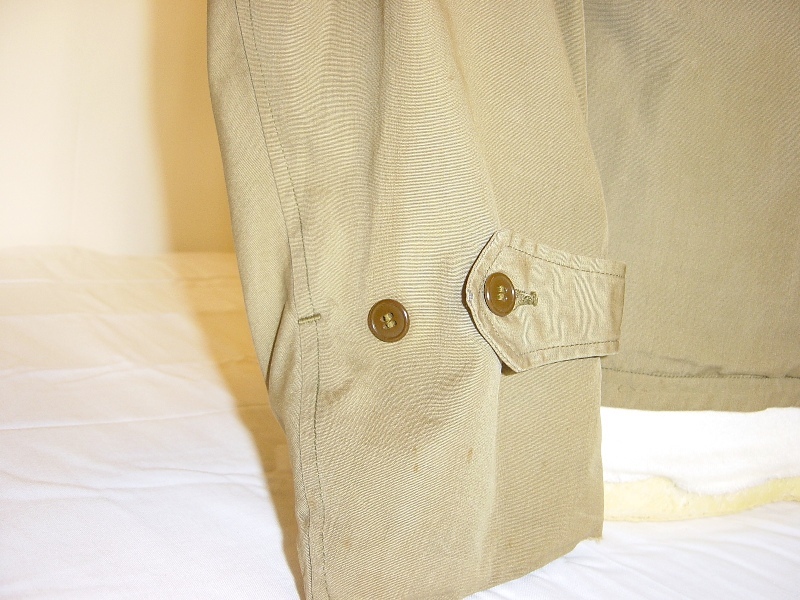 The lining was made of flannel wool for insolation, the same fabric as what the service shirt is made of. Considered too light, this was changed to a somewhat heavier wool lining. 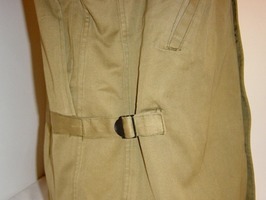 There were variations tested with and without the shoulder loops and pocket flaps. At the wrists were straps to tighten the cuffs, and at the hips were straps for adjustment. 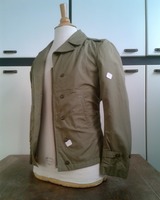 Finally the poplin jacket with the pocket flaps but without the shoulder loops was accepted. 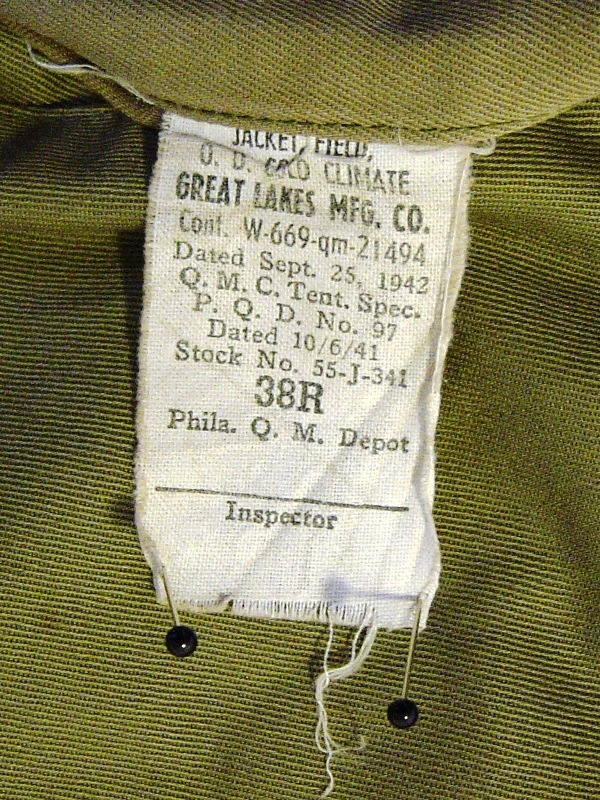 Standardized as the "Jacket, Field, od", patern date 1/24/41, P.Q.D. No. 20. These jackets were made in fair numbers and were issued until the stock was exhausted during the early stages of the war. 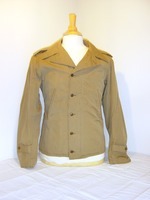 This type of jacket can be seen worn during the North Africa, Sicily and even the early Italian campaigns. No equipment was to be wasted! The pocket flaps were omitted, but shoulder loops added. 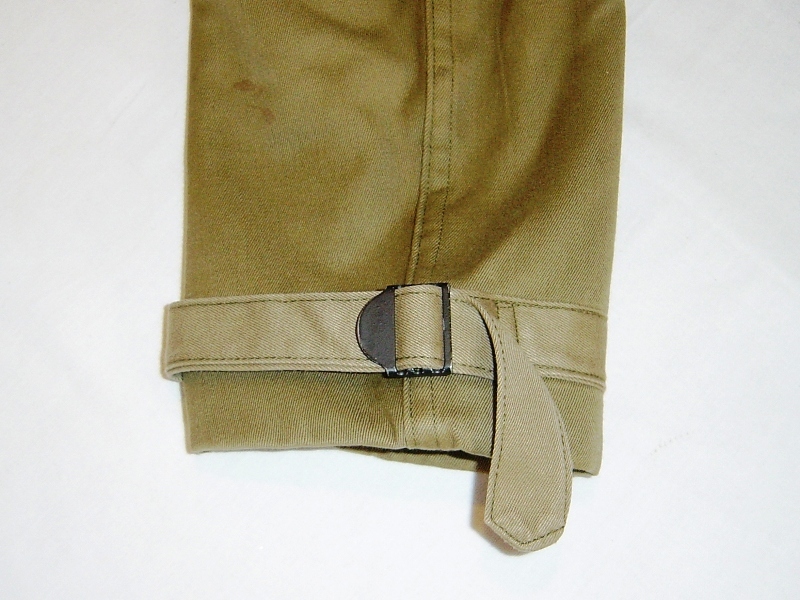 The second button for the wrist strap was placed a little further away and an extra button was added at the waist for better adjustment. 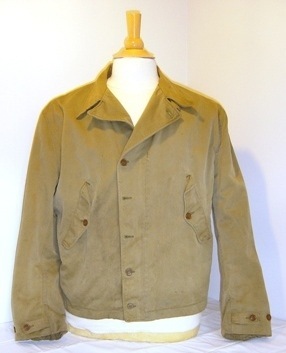 This jacket became standard issue for all personnel in the Army and the Army Air Corps. (Yes, that includes paratroopers, tank crew, pilots, et cetera.) Later the U.S. Marine Corps also adopted this jacket for field use. Interestingly there's a second patern date: 3/17/42, P.Q.D. No. 20B. 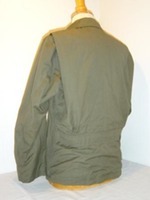 The 20A/20B version is generally called the M-41 jacket by collectors. I checked both the 20A and 20B styles, but frankly I cannot find one darn thing that is different about the two. So, if anyone has an idea, please let me know. The only thing I can come up with is that the OD#3 color became standardized. Just a thought. 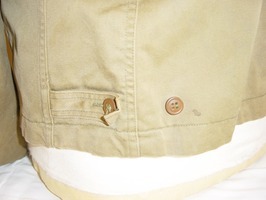 Some color variation can be found with the buttons that were used. Different companies were contracted for production and all had their own source for buttons, zippers, and fabric. Three zipper brands can be found with these jackets. 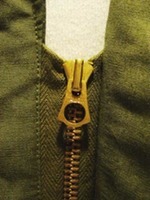 These are the Talon zippers (nickel coated), Crown zippers (zinc coated), and the Conmar zipper (gilt coated) . 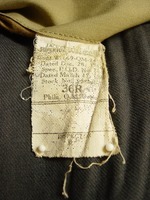 All manufacturers have the specification label sewn in the right hand pocket. A size label was sewn on the liners back panel, only at the end of the production a small embroidered label was sewn in the collar. 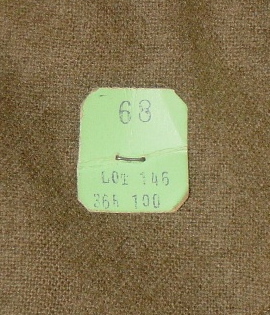 Sizes were given as chest size indicated by a number (34 thru 46) and the length by a letter (S - short, R - regular or L - long). But during the North-African campaign it was found lacking warmth and the pockets of too little capacity. 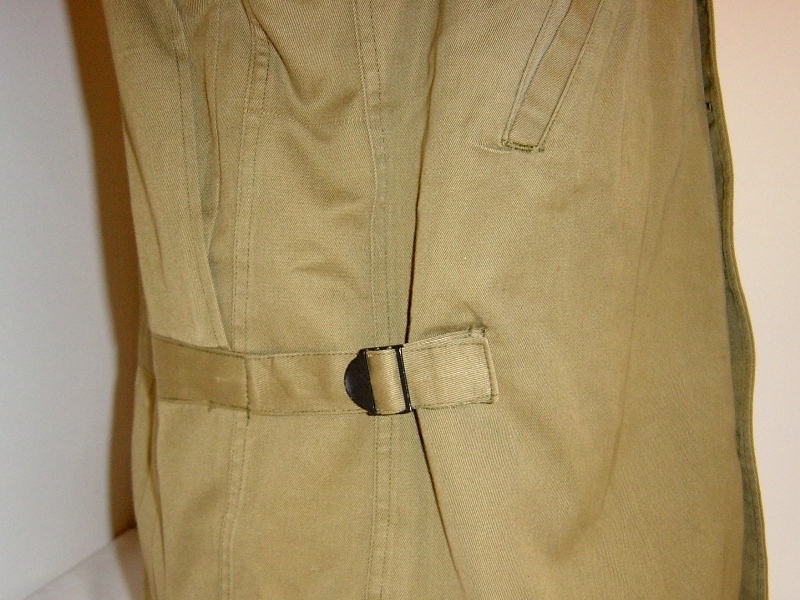 Although the pockets could contain a D-ration or a hand grenade, it was uneasy to reach inside, when an ammunition belt was worn over the jacket. To solve this problem, infantrymen tighten the belt around the waist and would fill the jacket’s inside with rations and extra ammunition. This can be seen in wartime photos. An important problem was the conspicuous color of the jacket. The OD#3 just wasn’t concealing enough. 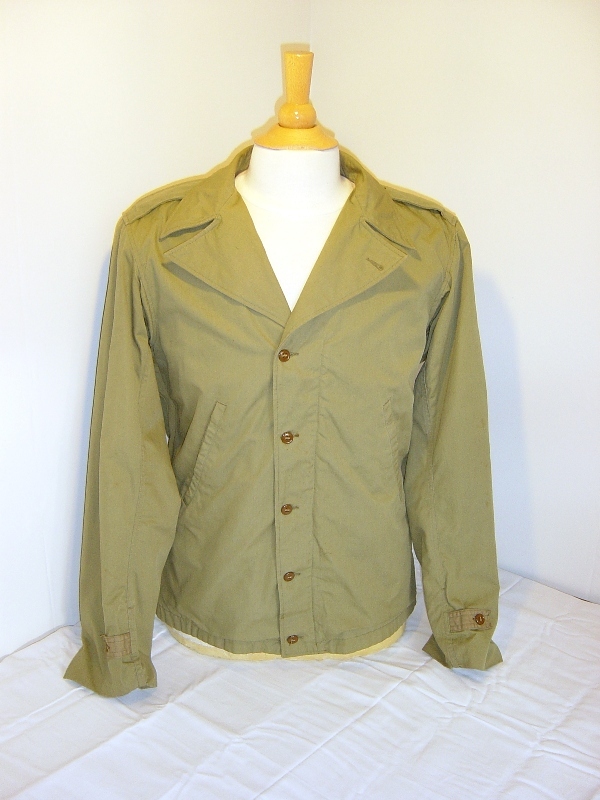 After the Normandy invasion, troops found themselves in the bocage, and with an abundance of summer green foliage the jacket stood out. 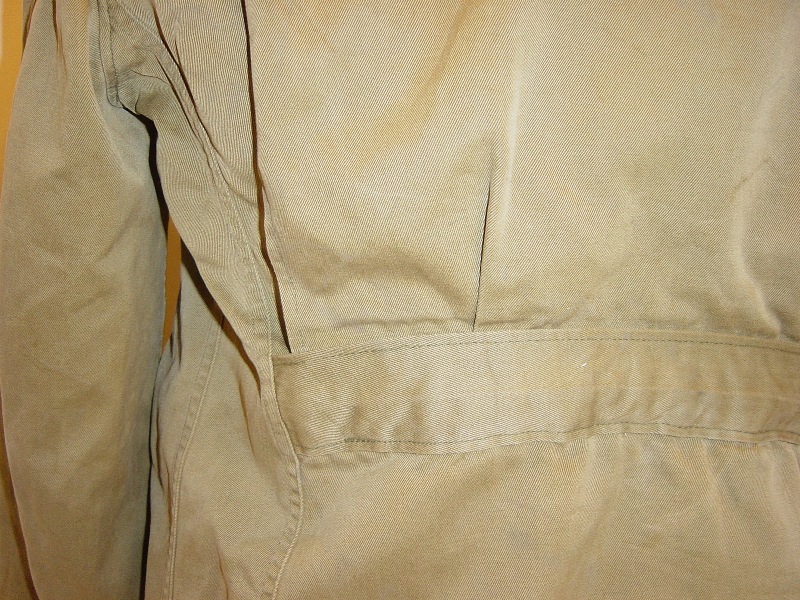 A solution the GI’s resolved to was wearing the jacket inside-out. 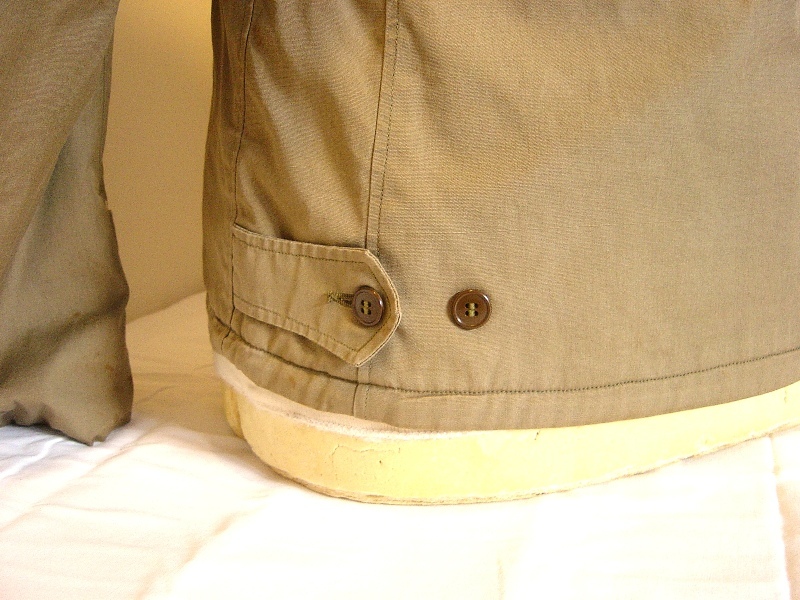 The darker wool lining gave better concealment, but denied the use of the pockets. 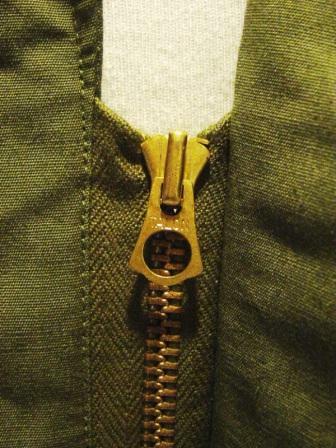 It was also awkward to put the jacket on, because the zipper couldn’t be pulled up from the outside. A medic checks on a German casualty. 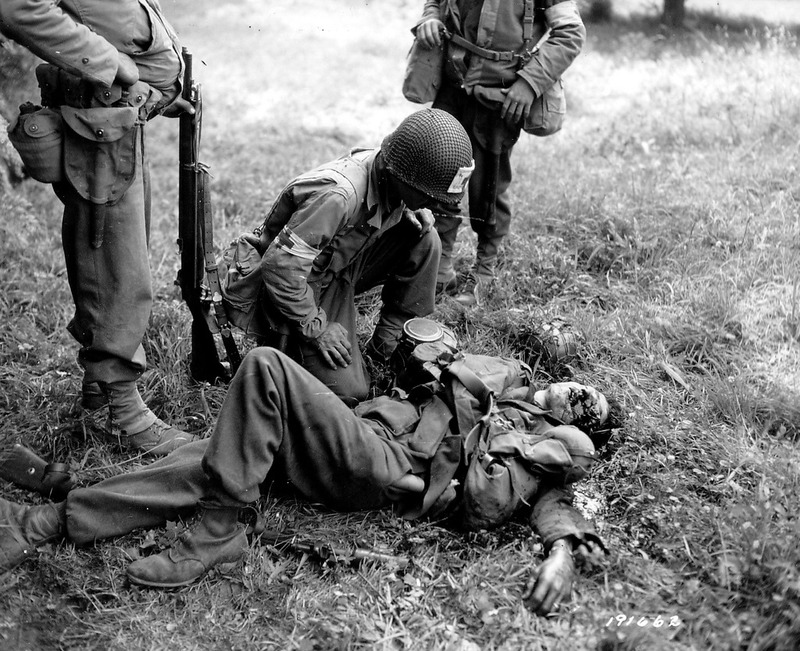 Of interest is the GI on the left who has the inside of his jacket stuffed with supplies, while the medic standing on the right is wearing his jacket inside-out. 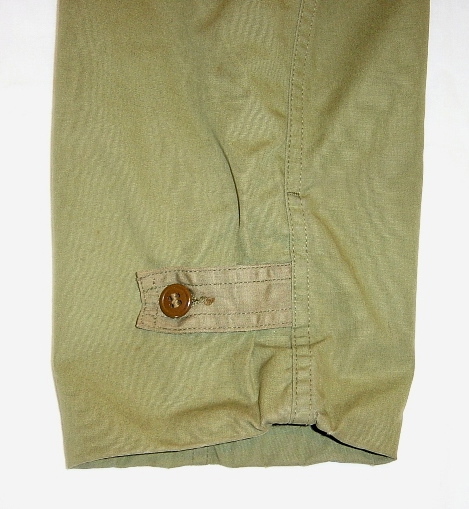 The new uniform was produced in the newly standardized OD#7 green. 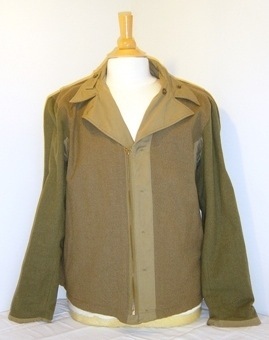 The replacement by this new jacket was not fully completed when the war ended. 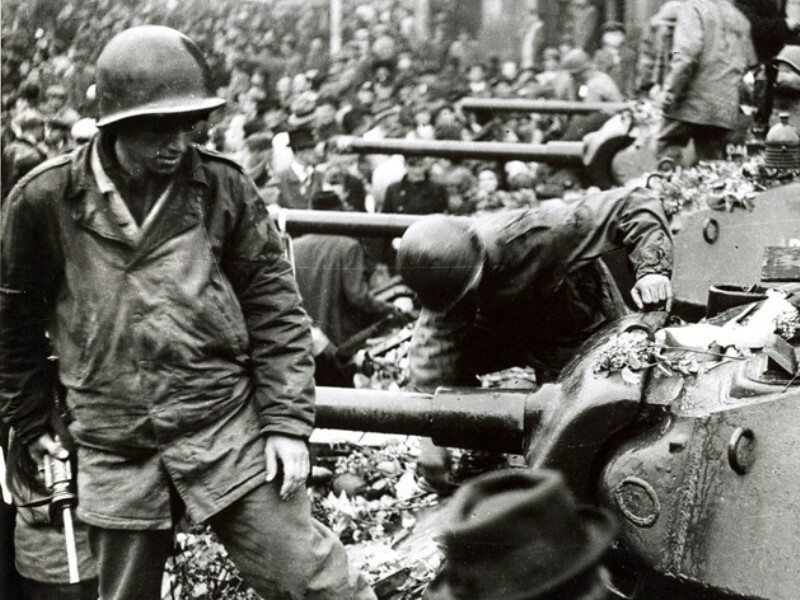 Many photos of the final victory still shows soldiers dressed in the old M-41 jackets. Altough officially accepted in 1941, it is known as the M-38 by collecters to make a distinction between the first and latter type. 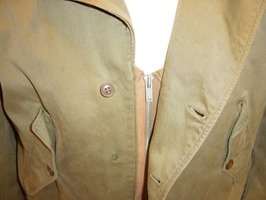 Shown here are a few photos of the M-38 “Parsons” jacket. 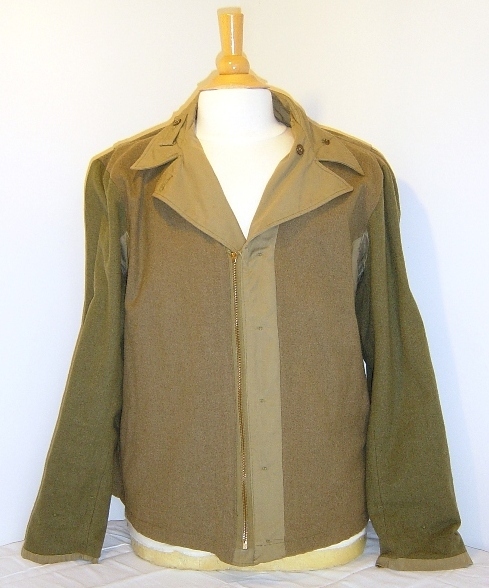 This is the experimental twill outer shell variant, without the shoulder loops, but with the pocket flaps. It has the flannel shirt weight lining. 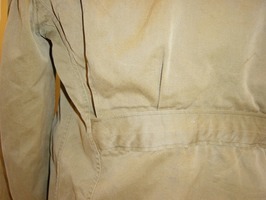 This jacket has it’s sleeves shortened approximately half an inch due to wear. It is also missing a few buttons on the front closure. 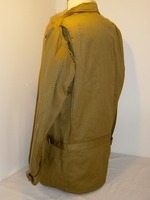 This is the final version of the field jacket as it was worn through out the war. The outer shell is the fragile poplin fabric with a wool lining. These pictures give a little idea about the camouflage value of the outer shell compared with the lining. The American officer was supposed to buy his own uniform. 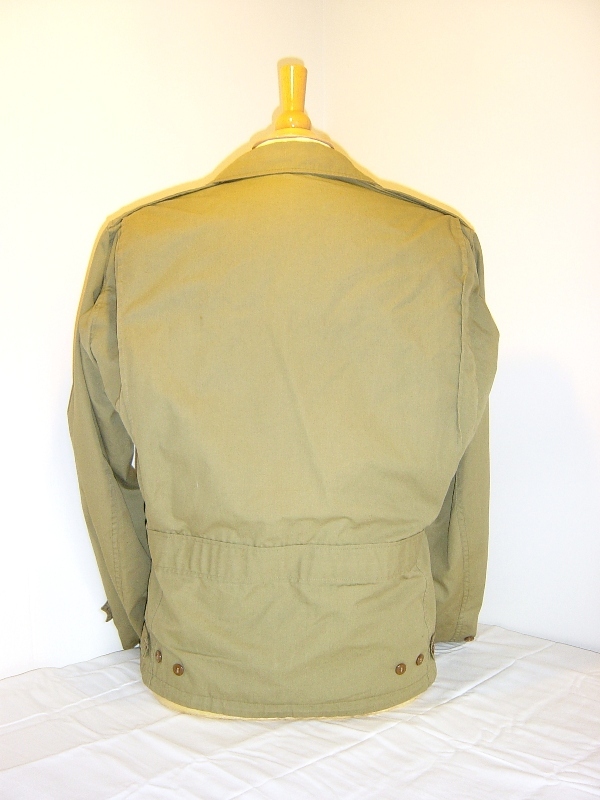 There were specialized tailors, or, uniform companies, who carried a more sophisticated version of the field jacket in their catalogue. 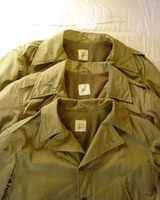 These jackets were cut like the army jacket, but made with a finer or heavier lining. 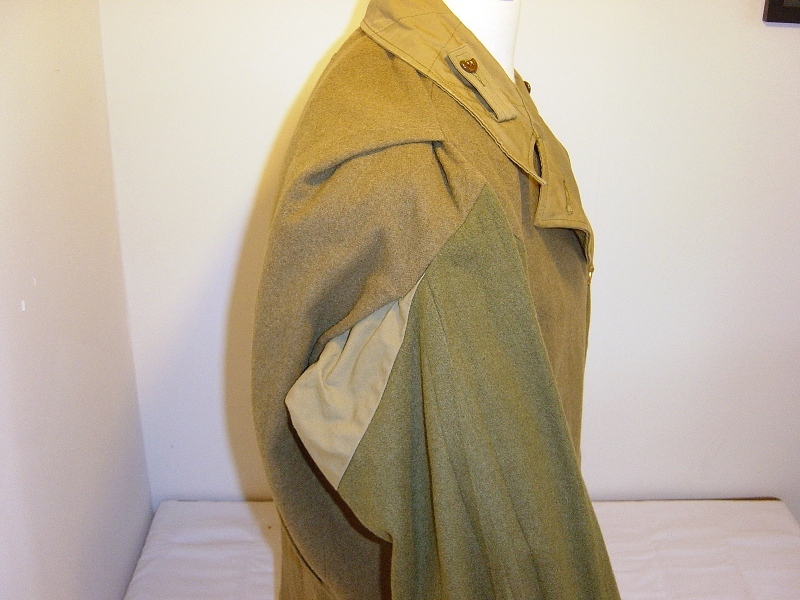 The version I have is with a heavy blanket wool lining, and has detachable shoulder loops. The outer shell is made of poplin. These were made and sold by civilian companies, not the army. There was no such thing as an issue “officers jacket”! 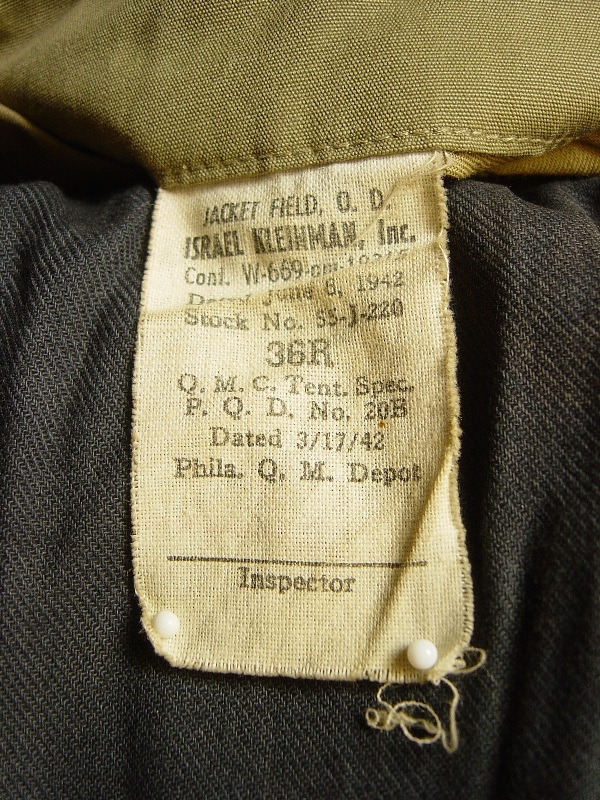 The tailor-made jackets were probably worn only state side by officers who had administrative jobs. (Called desk-flyers in the Air Corps.) 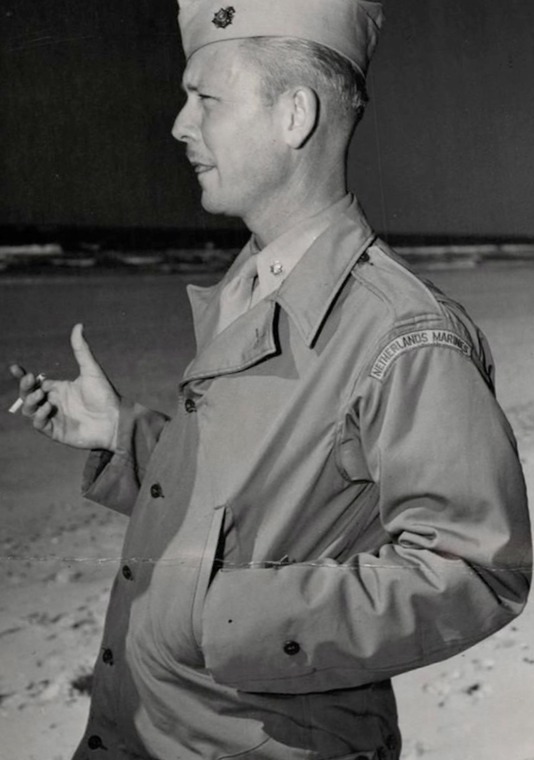 All the (junior) combat leaders wore the same jacket as the enlisted man, heck, even generals wore the issue jacket! Here’s shown one of the many versions of the M-41 jacket offered for private purchase. 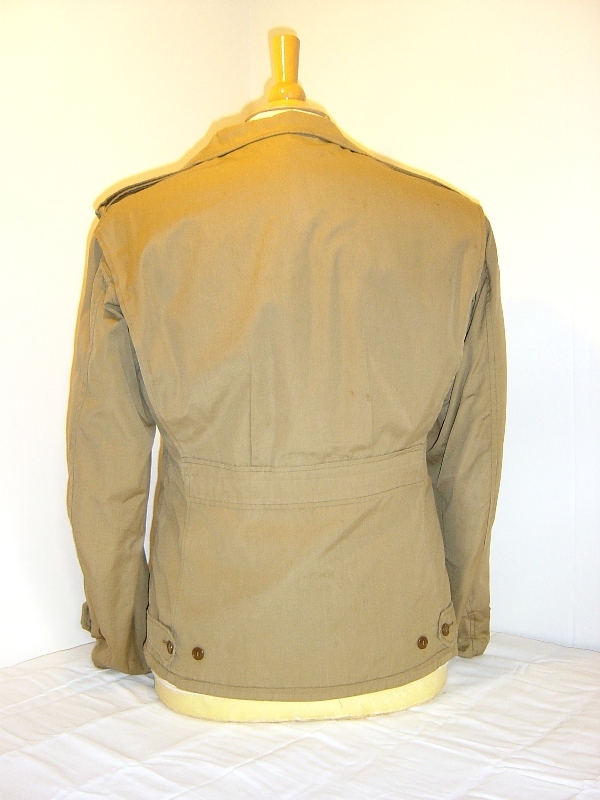 An officer in the rear echelon or state side, who could spare an extra dollar, could make a nice appearance in a tailored jacket. 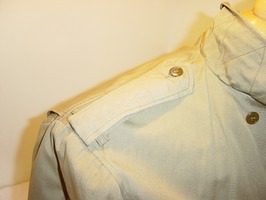 Although made of the same materials, poplin and wool, the cut gave it a smarter appearance then the regular issue jacket. 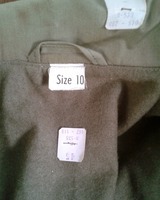 Some had a rayon lining, with an extra zip-in (or button-in) wool lining. Notice the shape of the straps, which gives it a more stylish look. 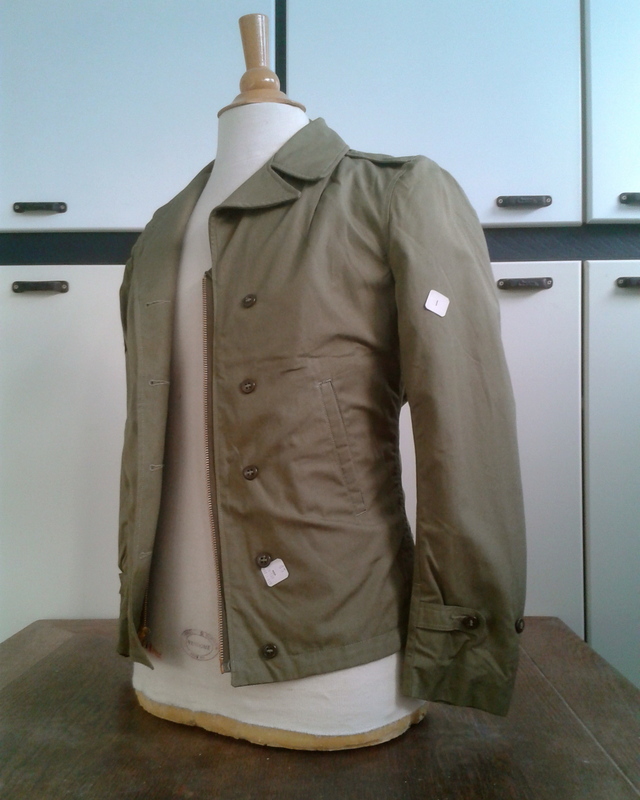 Made longer to cover the hips, the jacket is made with a thicker cotton shell and heavier wool lining, just like the tankers jacket. The straps at the side and wrist are of the buckle and strap type instead of the regular buttoned tabs. in bitter cold weather. 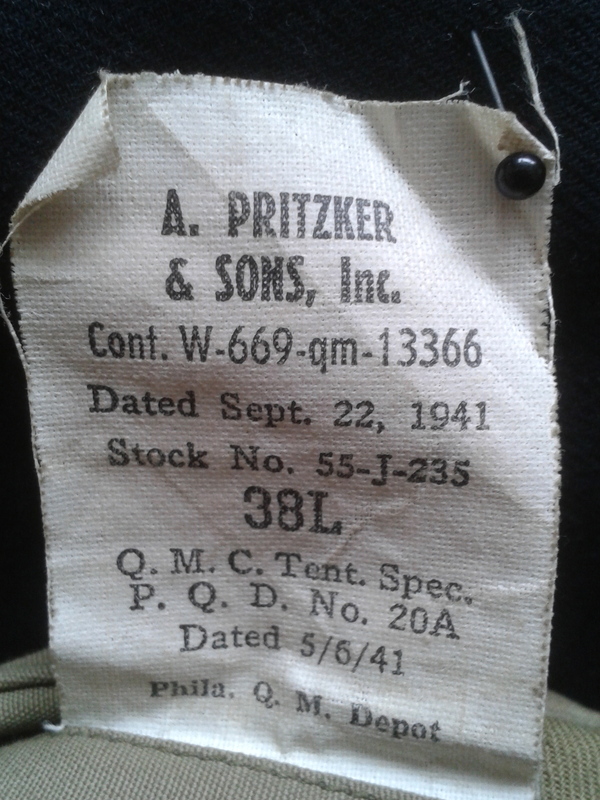 These jackets were issued to the infantry who fought for Attu and Kiska to take ‘em back from the Japanese. When the Germans launched their winter offensive, which became known as the Battle of the Bulge, there was an immediate shortage of winter combat clothing. 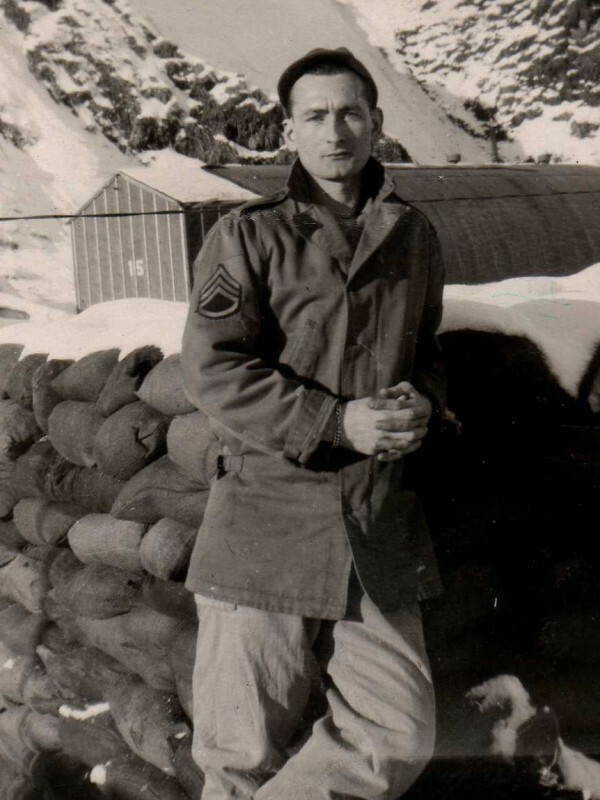 The old overcoats were issued, but were totally inadequate for fighting in snow and rain. Some were able to lay their hands on the tanker jackets and pants. 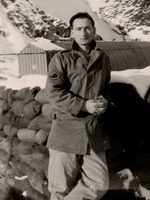 To provide the troops with a combat jacket for the upcoming winter campaign, some units were issued the arctic jackets. One of the units who received a great number jackets was the 2nd Infantry Division. 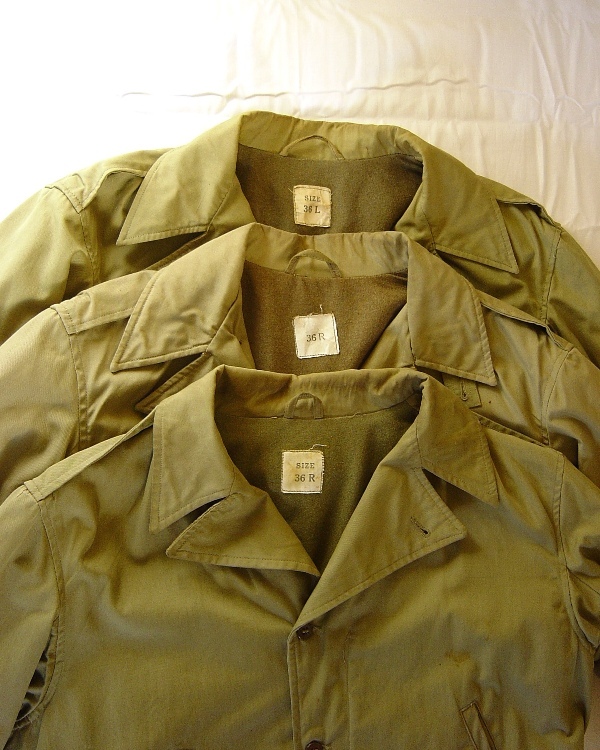 The boys who survived the brutal winter fighting, wore these jackets right into Czech until VE-Day. 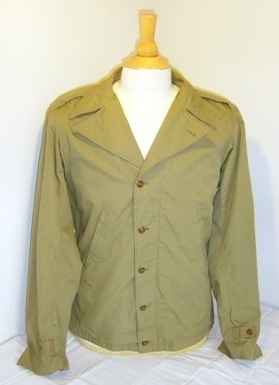 However, the U.S. Marine Corps did procured a female version of the M-41 jacket. 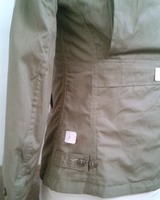 The button closure was opposite of the male version. Back in the days all female clothing had a left-hand closing. 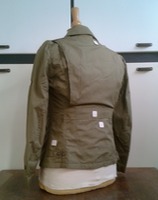 The jacket was cut to follow the female curves. 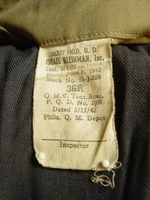 Nomenclature: “Jacket, Field, U.S.M.C.W.R.”,or "Jacket, Field, Women's Reserve" with Nom #####. The Navy adopted its own design based of the field jacket. 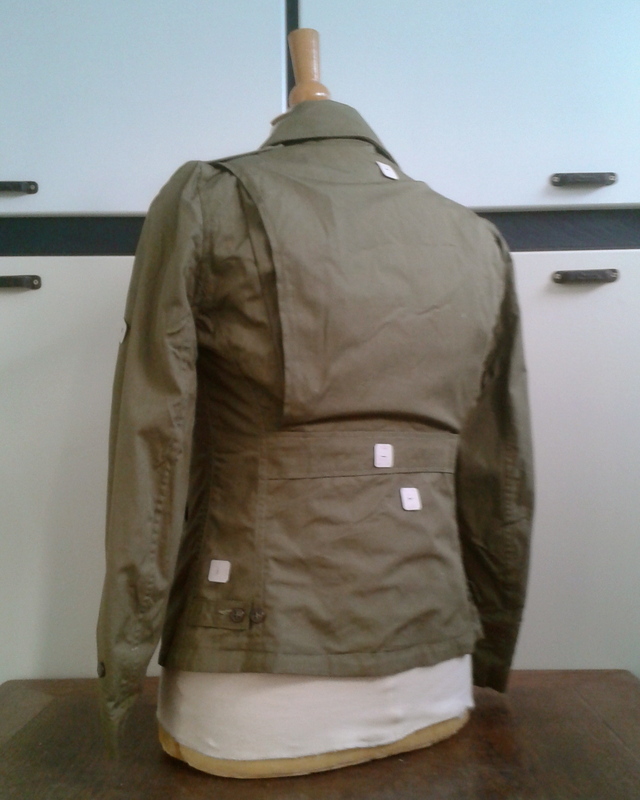 Made in a dark green, this jacket has no shoulder loops or adjustment straps. On the left breast was U.S.N. stamped in bolt black letters. 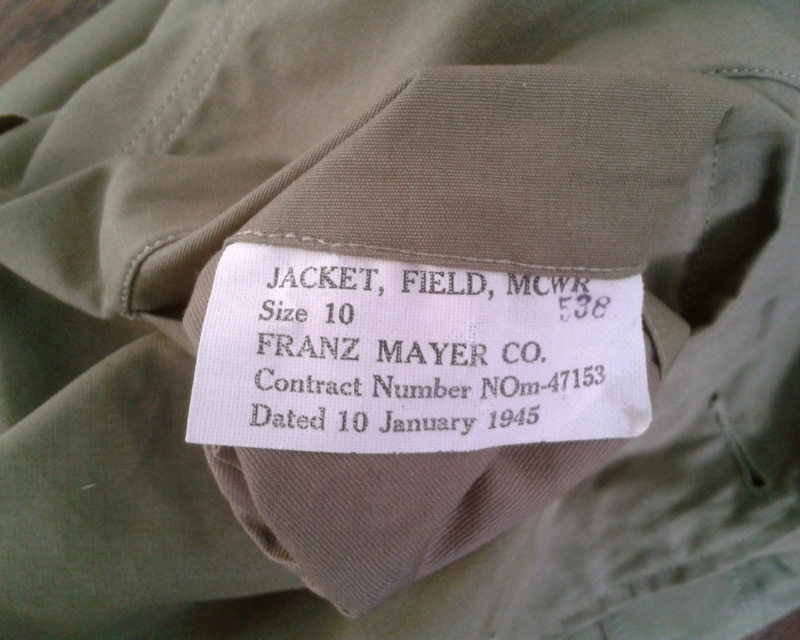 Most contract dates found on these jackets are late 1944/early 1945. This jacket was still an issue item in the late 50’s, early 60’s. 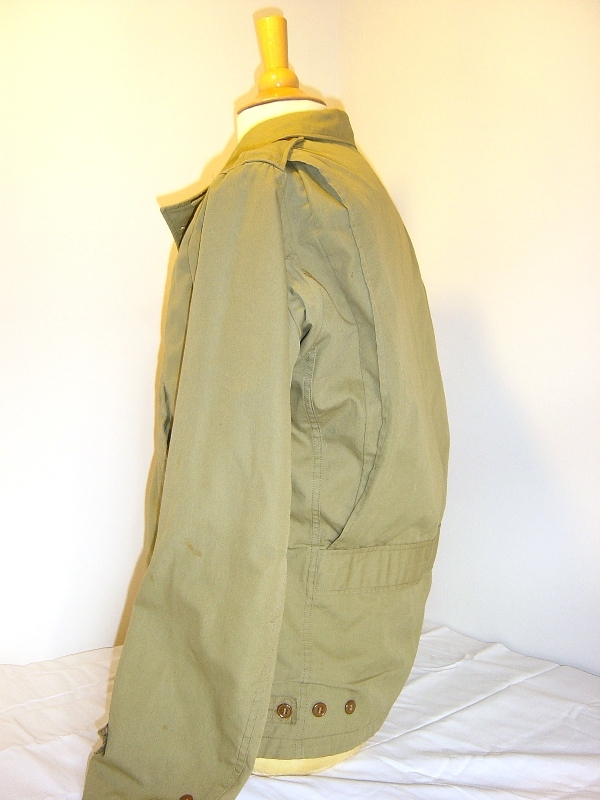 Generally referred to as the Navy M-41 jacket, it is officially called the “Jackets, Field, N-4”. 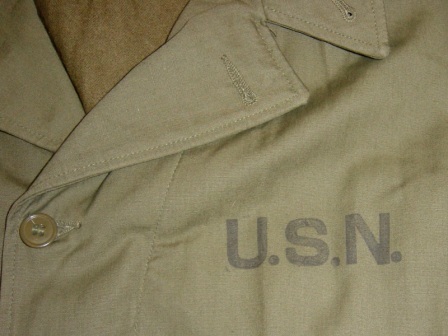 In the Navy all jackets used for work were habitually called a deck jacket. 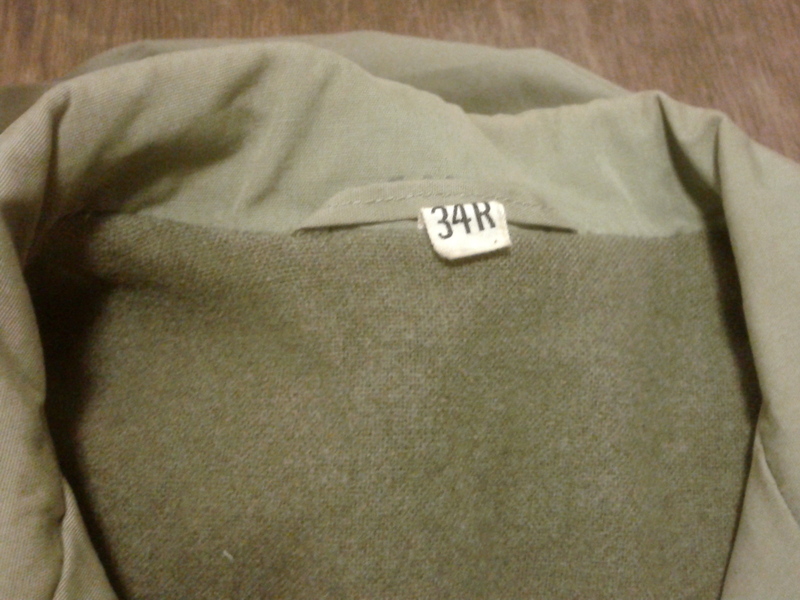 When the Army adopted the M-43 jacket, it discontinued the procurement of the M-41 jacket. 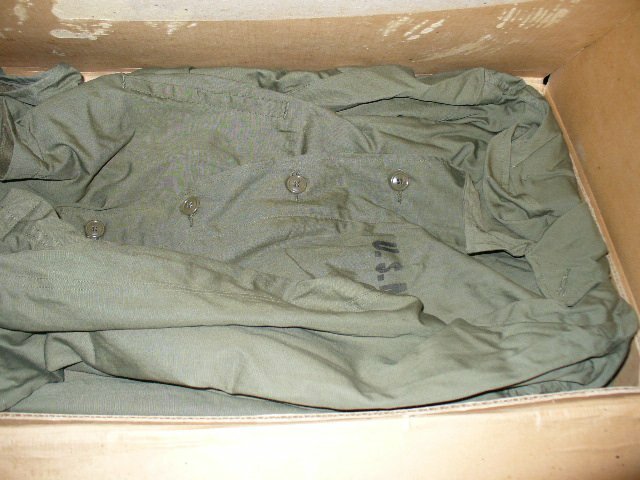 Up till then the U.S. Navy was issuing M-41 jackets to its members who had to work on the beaches during an invasion, or other shore related work. This could be a Navy Shore Party or a “Seabees” Construction Battalion. 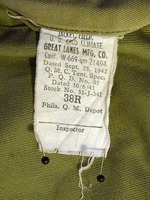 Because it was intended for shore use, it was considered a field jacket. But it was also issued to ship crew members in lieu with the heavier N-1 deck jacket. 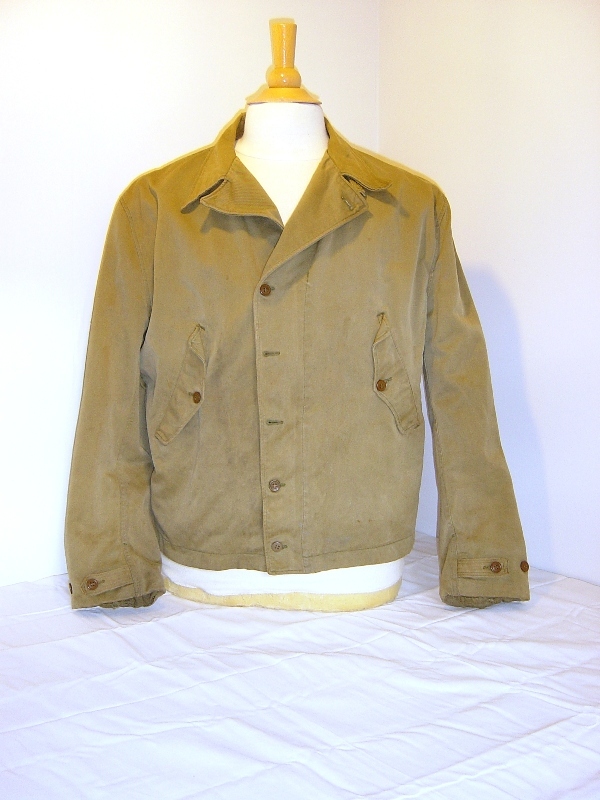 The jacket pictured have a contract number dated approximately November 1944. Most jackets found today have contract numbers dating late 1944 or early 1945. With the upcoming invasion of the Japanese home islands all armed forces were still procuring large amount of uniforms and equipment. 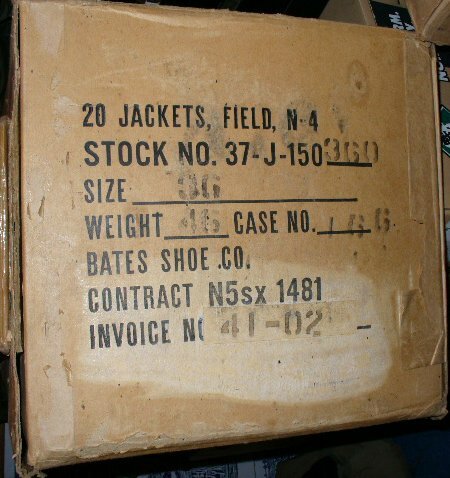 When the war suddenly ended the Navy found itself with an adequate amount of field jackets in stock to last for years. And it did! 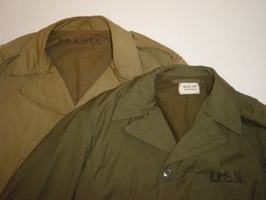 These jackets can also be found with a blue U.S. Air Force fabric tape sewn over the U.S.N. stencil. 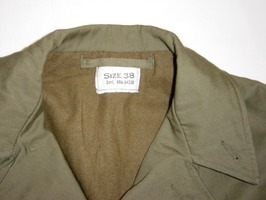 I guess the Air Force needed a field jacket for their mechanics and bummed some from the Navy. 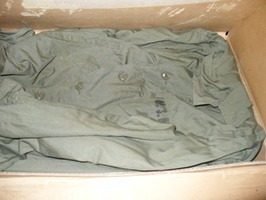 The last two pictures I found on a forum showing a box in which the jackets were packed in, and delivered to the Navy. 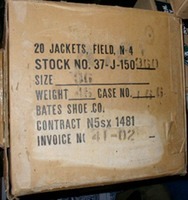 The contract number on the box refers to the date that the contract was awarded to the Bates Shoe Company. This was done, in this particular case, between May and April of 1945. Awarding a contract doesn’t mean that the jackets were delivered the following morning! Production lines had to be set up, and matèriel had to be procured, like fabric, buttons and zippers. 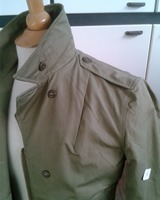 Depending on the number of jackets ordered, the production could take days or weeks. Then it had to be delivered to the Navy, who would have to distribute them. Obviously the war ended before wide spread issue was completed. It is doubtful if these jackets saw any combat at all. After the war some surplus stocks were sold to the public for $1.99 apiece. A price a collector can only dream of! 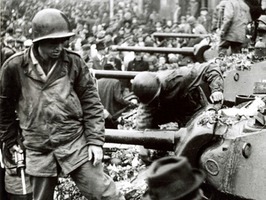 It was still use by the Marines who fought in Korea and it was issued to foreign allies under aid programs. 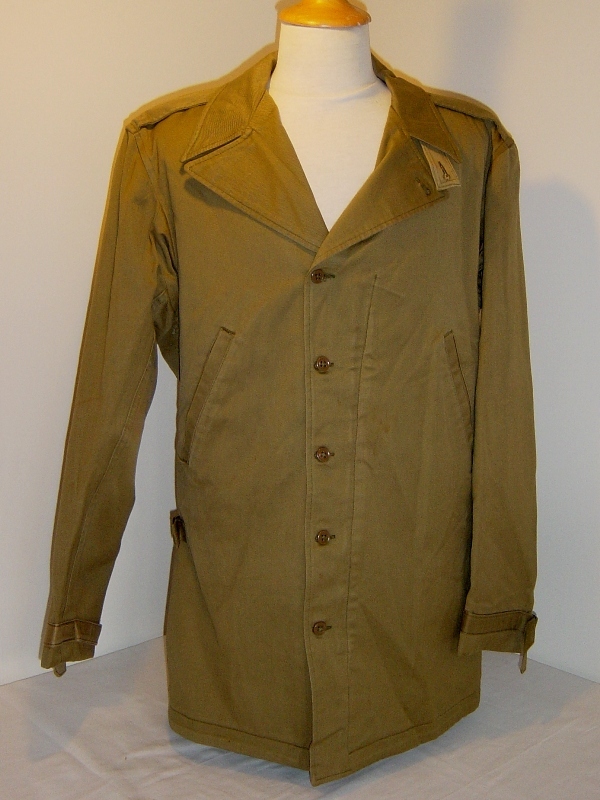 The first Dutch volunteers, who went to fight in Korea under the flag of the United Nations were issued the flimsy field jacket. After the first winter in Korea the Dutch Battalion (attached to the 2nd U.S. Infantry Division) was issued the M-43 jacket with the pile liners. This was greatly appreciated, although a bit late. Note: Never machine wash this jacket, but have it dry-cleaned.